i already applied ATAL PENSION YOJANA in SBI. I am 21years old. If I register under APY, after completion of 60 years how long will I receive the pension.?? And after my death if the nominee also dies who will receive the pension.?? Summit you will receive apy pension as long are alive. After if nominee also die then the apy pension amount will be given to the nearest kin in blood relation. For the age of 20 yrs. Rs.248/- is the monthly contribution for individual. Please let me know after five years how much amount I have to contribute per month, because the govt contribution is only for five yrs. If you do not have any one who is above 18 then you can definitely declare your 9 years old child as nominee for the Atal Pension Yojana (apy) scheme. I have already enrolled for ATal Pension yojana Scheme. However, i want to change my bank, is this possible? I’m not sure if portability of Atal Pension Yojna is allowed between banks. Try calling on 1800-180-1111 / 1800-110-001. 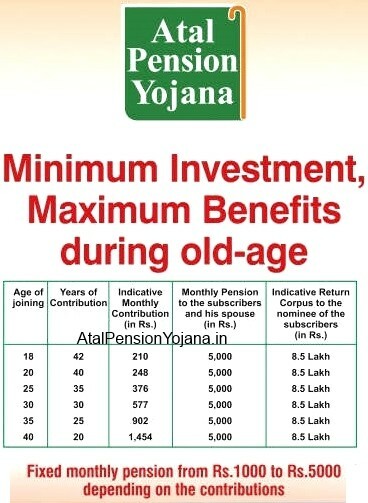 It is the national toll free number of Atal Pension Yojna. If you get satisfactory answer, then you can add it here. It will help others to understand apy scheme better. For APY, govt. will contribute 50% of the total contribution or Rs.1000/- per annum whichever is lower who join the scheme 01 jun 15 to 31 dec 15. The govt contribution will be for 5 yrs. from 2015-16 to 2019-2020. Suppose my contribution is Rs.230/- per month i.e. Rs. 230 x 12 = Rs.2760/- we are contributiong per annum & govt contribution for the same is Rs.1000/-. After five yrs how much I have to contribute per month, because at present govt is contributing 50%. As per the notification tax payers are not eligible for this scheme. Suppose I have joined the APY at the age of 19. After 5 yrs I have become a tax payer. So can I continue this schem. If I can continue this scheme what is the amount of monthly contribution for me. In a recent update as per pfrda, any citizen of India can apply for Atal Pension Yojna. But who so ever is already getting benefit from government or through employee provident fund will not get contribution from government side. Where as apy is mostly focused on financial inclusion to help the lowest strata of the Indian society. can i add my spouse as nominee in APY scheme? also, what is procedure for closing APY before maturity? scheme with lump sum withdrawal. Thanks for your comment Sir. Now I want to know the procedure to exit from APY or Block my one out of two APY A/C. I am a customer of SBI, MAnkar Branch, West Bengal. I applied for APY of Rs. 5000. Accidentally two APY A/C has been open in respect of a single SBI A/C and two (02) nos. Premium of Rs. 990/- each is deducting from my A/C. I contact with customer care of APY, they told that bank can block one APY A/C. But when I request the bank, they can not say anything regarding this matter, even they does not know where to contact for this problem and how to do solve this. I request you to suggest me what should I do to block one APY A/C and return my premium. Any subscriber can also exit from Atal Pension Yojana (apy) Scheme provided they give up on the contribution given by the government and also the net actual interest earned on his/her contributions. Just simply close one of the account. I’m not sure if change of nominee is allowed. Kindly call on toll free no. of atal pension yojana 1800-180-111 / 1800-110-001 to know more. My qus. Is that can a spouse are nominee in apy. Yes, in Apy, husband can nominate wife as nominee. I want to inform you that i want to enroll for the scheme but our bank that is SBI says that they don’t have any info about apy scheme. So what should we do?? They say us to visit the website. But there are many more queries which r nt answered in the sites so wht should we do?? I Am devendar, I enrolled to Atul pension scheme. I got My pran and premium is getting debited from my savings account. 1. I am 38 years, am i eligible for Atal Pension Yojana. 2. To get pension of 5000 per month, how much premium i have to pay per month / year. 3. In case of death before 60, for how many years, the nominee will get the pension. 4. Which all documents are valid to join the yojana, in case if the candidate doesn’t have adhar card, if passport / PAN card is acceptable. Here are answers to your quarries. a1. You are eligible for Atal Pension Yojana (apy) scheme because you are age is less than 40.
a3. As long the nominee is alive. a. Adhar card is manditory to apply for the Atal Pension Yojana (apy) scheme.